I keep seeing lots of fruits and veggies together. Fruit salsas and the like… it’s a great way to spice up your daily salad. Then I saw one for pineapple, cumcumber, cilantro and red onion. A little onion goes a long way with me. – … and skipped the onion. It was recommended on grilled chicken, or pork, or mixed with tuna. You could also use it as a dressing. It was very refreshing! What other fruit salsa topping do you enjoy? 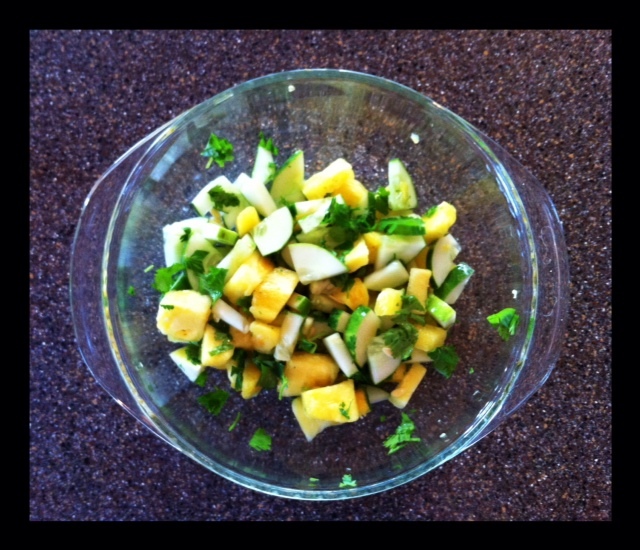 Posted on July 30, 2012, in Food To Try and tagged Gluten-Free salsa, healthy for him, Pineapple Salsa. Bookmark the permalink. Leave a comment.